A cryptocurrency wallet is only similar to a physical wallet in that both give you access to your financial assets. In reality, though, a crypto wallet primarily stores what are called your private keys. Such a key is simply a long string of characters that allows you to buy, sell, or send the cryptocurrency that you own. Since anyone who knows your private key essentially “owns” your crypto assets, securing this information is critical. The advantage of purchasing cryptocurrency in your IRA is that some crypto custodians will secure your assets for you, utilizing cold storage, personal hardware devices, and vaults (even insuring your assets). If such benefits are important to you, keep an eye out for them when choosing a Digital IRA services company. 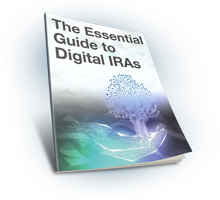 With BitIRA’s proprietary wallet solution, you have “The World’s Most Secure Digital Currency IRA”. Your cryptocurrencies are stored in multi-sig wallets, with each key held in separate physical locations. Without your personal authorization, plus other trusted parties, your funds cannot be accessed. Wallets for each account are held on your own personal, custom hardware devices from Ledger that are encrypted with a passcode. Your device will never be physically handled unless you would like to make a transaction. Devices are held in cold storage at a state-of-the-art depository, inside Class 3 vaults, and protected by armed guards. All of your assets held in storage are protected by end-to-end insurance from any type of theft, fraud, mistakes and hacking. The entire process is fully Compliant with CryptoCurrency Security Standards, which ensures the highest degree of security. To read even more about the world’s first and only insured cold storage solution for Digital Currency IRAs, click here.